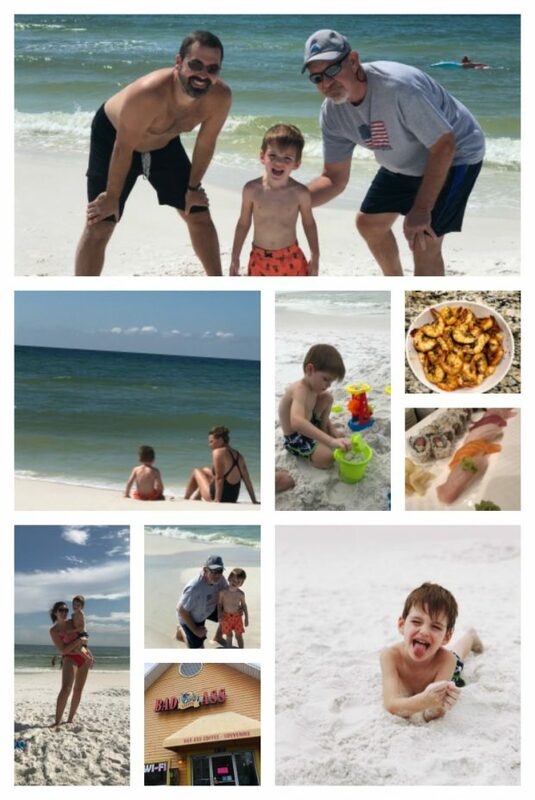 As we’ve done for the past couple of years, we headed down to Destin for our annual Labor Day trip. We actually went down for the second part of the week, so we missed the crowded-ness that normally comes with a Labor Day beach trip. Unfortunately for us, the beach was being hit with a tropical storm our first day down there, so we were pretty much confined inside. Anyway, we drove down Tuesday night, made a pizza and my dad and I stayed up and drank way into the night. Wednesday night, we stayed in most of the day since it was rainy and gross. Sheff played and watched some TV, and we had a shrimpsgiving for dinner. Thursday we finally got to have a beach day! It was still a little overcast, but it made for a pretty good day to just lounge on the beach, read and build sandcastles with the boogs. The water was still rough from the tropical storm, so there was no having fun in the water that day. Eventually during the afternoon, it started to clear up and the sun even came out for a little bit. My dad wasn’t feeling well that night, so B and I got to have a fun date night. We went to Sushimoto, and had some amazing sushi. We then went and played some miniature golf! After our round of golf (which I lost, boo), we headed over to a super fun dive bar for some cocktails and karaoke. It was such a fun date night reconnecting with the hubs. Friday we finally got a nice sunny day! We spent the whole day down at the beach, playing in the ocean and in the pool. We hit up Pompano Joe’s for our traditional family dinner out, having beachy cocktails and seafood. Sheffield was the most behaved he’s ever been at a restaurant, and even ate his cheeseburger. We ended our vacation on the patio with some wine and conversation. We got up bright and early on Saturday to head back to Bham. It was such a fun trip, and since my two weeks notice at my previous job had ended on Tuesday, I actually had a stress-free vacation with zero worries about work, or anything really. It was an amazing way to get refreshed for my new job, and to focus on the fam. I need details on your new job! !